How Often Do Chinese Philosophy Journals Cite English-Language Work? In a sample of elite Anglophone philosophy journals, only 3% of citations are to works that were originally written in a language other than English. Are philosophy journals in other languages similar? Do they mostly cite sources from their own linguistic tradition? Or do they cite more broadly? 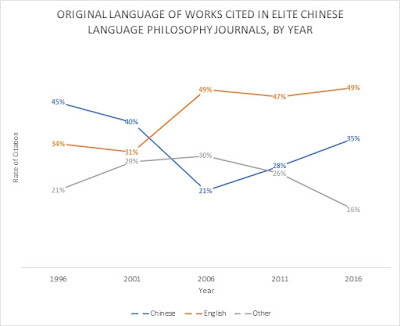 In our sample of 208 Chinese-language articles, 49% (1422/2929) of citations are to works originally written in languages other than the language of the citing article, in stark contrast with our results for Anglophone philosophy journals. English is the most frequently cited foreign language, constituting 31% (915/2929) of all citations (compared to 17% for all other languages combined). Other cited languages are German, French, Russian, Japanese, Latin, Greek, Korean, Sanskrit, Spanish, Italian, Polish, Dutch, and Tibetan. Our sample of elite Anglophone journals contained no journals focused on the history of philosophy. In contrast, our sample of elite Chinese-language journals contains three that focus on the history of Chinese philosophy. Excluding the Chinese-history journals from the analysis, we found that the plurality of citations (44%, 907/2047) are to works originally written in English (often in Chinese translation for the older works). Only 32% (647/2047) of citations are to works originally written in Chinese (leaving 24% for all other languages combined). Looking just at the journals specializing in history of Chinese philosophy, 98% (860/882) of citations are to works originally written in Chinese – a percentage comparable to the percentage of same-language citations in the non-historical elite Anglophone journals in our earlier analysis. Chinese journals specificially discussing Chinese history cite Chinese sources at about the same rate as Anglophone journals cite Anglophone sources when discussing general philosophy. We were not able to determine original publication date of all of the cited works. However, we thought it worth seeing whether the English-language citations are mostly of classic historical philosophers like Locke, Hume, and Mill, or whether instead they are mostly of contemporary writers. Thus, we randomly sampled 100 of the English-language citations. Of the 100, 68 (68%) of the cited English-language works were published in the period from 1946-1999 and 19 (19%) were published from 2000 to the present. Finally, we broke the results down by year of publication of the citing article (excluding the three history journals). This graph shows the results. Point-biserial correlation analysis shows a significant increase in rates of citation of English-language sources from 1996 to 2016 (34% to 49%, r = .11, p < .001). Citation of both Chinese and other-language sources may also be decreasing (r = -.05, p = .03; r = -.08, p = .001), but we would interpret these trends cautiously due to the apparent U-shape of the curves and the possibility of article-level effects that would compromise the statistical independence of the trials. 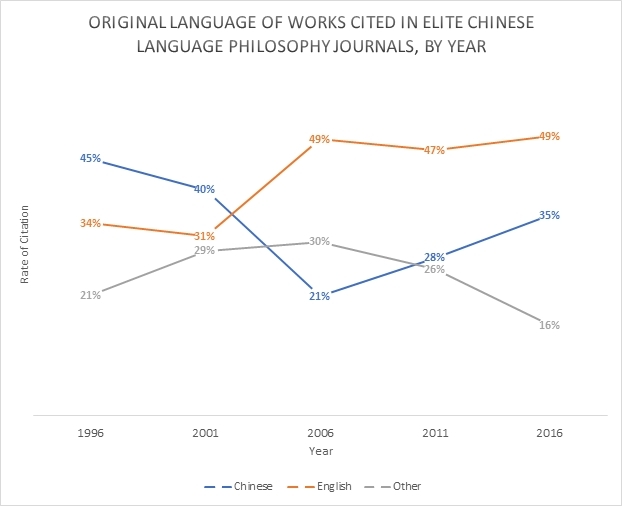 Citation patterns in elite Chinese-language philosophy journals thus appear to be very different from citation patterns in elite Anglophone philosophy journals. The Anglophone journals cite almost exclusively works that were originally written in English. The Chinese journals cite about half Chinese sources and about half foreign language sources (mostly European languages), with English being the dominant language in the foreign language group, and increasingly so in recent years. We leave for later discussion the question of causes, as well as normative questions such as to what extent elite journals in various languages should be citing mostly from the same language tradition versus to what extent they should aim instead to cite more broadly from work written in a range of languages. Stay tuned for some similar analyses of journals in other languages! Note 1: The journals are: 臺灣大學哲學論評 (National Taiwan University Philosophical Review), 政治大學哲學學報 (NCCU Philosophical Journal), and 東吳哲學學報 (Soochow Journal of Philosophical Studies), which are ranked as the Tier I philosophy journals by Research Institute for the Humanities and Social Sciences Ministry of Science and Technology, Taiwan; and 哲学研究(Philosophical Researches), 哲学动态 (Philosophical Trends), 自然辩证法研究 (Studies in Dialectics of Nature), 道德与文明 (Morality and Civilization), 世界哲学 (World Philosophy), 自然辩证法通讯 (Journal of Dialectics of Nature), 伦理学研究 (Studies in Ethics), 现代哲学 (Modern Philosophy), 周易研究 (Studies of Zhouyi), 孔子研究 (Confucius Studies), 中国哲学史 (History of Chinese Philosophy), 科学技术哲学研究 (Studies in Philosophy of Science and Technology), which are ranked as the core philosophy journals in the Chinese Social Sciences Citation Index by Institute for Chinese Social Sciences Research and Assessment, Nanjing University, China. We sampled the research articles of their first issues in 1996, 2001, 2006, 2011, and 2016, generating a list of 208 articles. 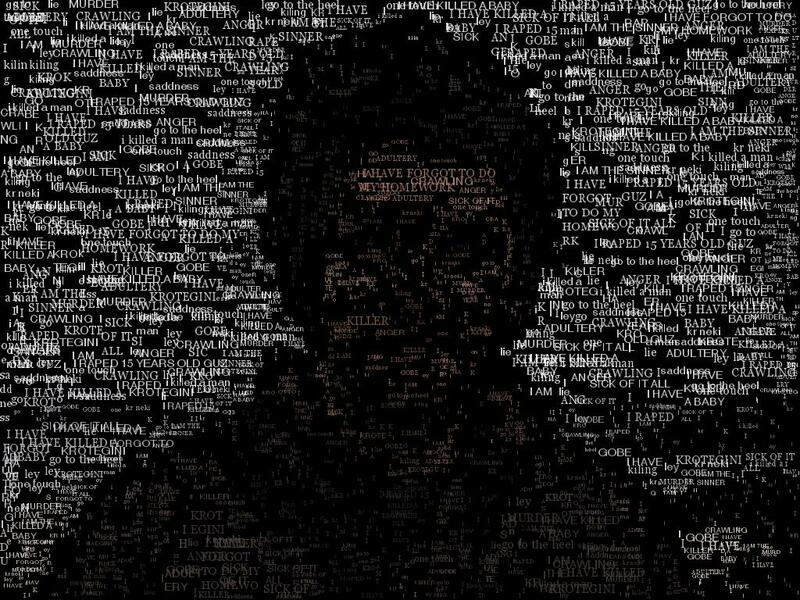 A coder fluent in both Chinese and English and with a PhD in philosophy (Linus Huang) coded the references of these articles, generating a list of 2952 citations to examine. For each reference, we noted its original publication language. Translated works were coded based on original language in which it was written rather than the language into which it had been translated. If that information was not available in the reference, Linus hand-coded by searching online or based on his knowledge of the history of philosophy. The original language was determinable in 2929 of the 2952 citations. Eric has previously argued that almost any answer to the problem of consciousness involves “crazyism” – that is, a commitment to one or another hypotheses that might reasonably be considered bizarre. So it’s in this spirit of openness to wild ideas I’d like to throw out one of my own longstanding “crazy” ideas concerning our identity as conscious subjects. To set the scene, imagine that we have one hundred supercomputers, each separately running a conscious simulation of the same human life. We’re also going to assume that these simulations are all causally coupled together so that they’re in identical functional states at any one time – if a particular mental state type is being realized in one at a given time, it’s also being realized in all the others. The question I want to ask now is: how many conscious subjects – subjective points of view – exist in this setup? A natural response is “one hundred, obviously!” After all, there are one hundred computers all running their own simulations. But the alternate crazy hypothesis I’d like to suggest is that there’s just one subject in this scenario. Specifically, I want to claim that insofar as two physical realizations of consciousness give rise to a qualitatively identical sequence of experiences, they give rise to a single numerically identical subject of experience. Call this hypothesis the Identity of Phenomenal Duplicates, or IPD for short. Why would anyone think such a crazy thing? In short, I’m attracted by the idea that the only factors relevant to the identity and individuation of a conscious subject are subjective: crudely, what makes me me is just the way the world seems to me and my conscious reactions to it. 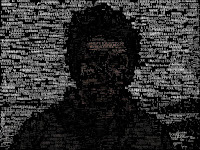 As a subject of phenomenal experience, in other words, my numerical identity is fixed just by those factors that are part of my experience, and factors that lie outside my phenomenal awareness (for example, which of many possible computers are running the simulation that underpins my consciousness) are thus irrelevant to my identity. Putting things another way, I’d suggest that maybe my identity qua conscious subject is more like a type than a token, meaning that a single conscious subject could be multiply instantiated. As a helpful analogy, think about the ontology of something like a song, a novel, or a movie. The Empire Strikes Back has been screened billions of times over the years, but all of these were instantiations of one individual thing, namely the movie itself. If the IPD thesis is correct, then the same might be true for a conscious subject – that I myself (not merely duplicates of me!) could be multiply instantiated across a host of different biological or artificial bodies, even at a single moment. What *I* am, then, on this view, is a kind of subjective pattern or concatenation of such patterns, rather than a single spatiotemporally located object. Here’s an example that might make the view seem (marginally!) more plausible. Thinking back to the one hundred simulations scenario above, imagine that we pick one simulation at random to be hooked up to a robot body, so that it can send motor outputs to the body and receive its sensory inputs. (Note that because we’re keeping all the simulations coupled together, they’ll remain in ‘phenomenal sync’ with whichever sim we choose to be embodied as a robot). The robot wakes up, looks around, and is fascinated to learn it’s suddenly in the real world, having previously spent its life in a simulation. But now it asks us: which of the Sims am I? Am I the Sim running on the mainframe in Tokyo, or the one in London, or the one in Sao Paolo? I find something very intuitive about the response IPD provides in this case. I realize, though, that what I’ve provided here isn’t much of an argument, and invites a slew of questions and objections. For example, even if you’re sympathetic to the reading of the example above, I haven’t established the stronger claim of IPD, which makes no reference to causal coupling. This leaves it open to say, for example, that had the simulations been qualitatively identical by coincidence (for example, via being a cluster of Boltzmann brains) rather than being causally coupled, their subjects wouldn’t have been numerically identical. We might also wonder about beings whose lives are subjectively identical up to a particular point in time, and afterwards diverge. Are they the same conscious subject up until the point of divergence, or were they distinct all along? Finally, there’s also some tricky issues concerning what it means for me to survive in this framework – if I’m a phenomenal type rather than a particular token instantiation of that type, it might seem like I could still exist in some sense even if all my token instances were destroyed (although would Star Wars still exist in some relevant sense if every copy of it was lost?). Setting aside these worries for now, I’d like to quickly explore how the truth or falsity of IPD might actually matter – in fact, might matter a great deal! Consider a scenario in which some future utilitarian society decides that the best way to maximize happiness in the universe is by running a bunch of simulations of perfectly happy lives. Further, let’s imagine that their strategy for doing this involves simulating the same single exquisitely happy life a billion times over. If IPD is right, then they’ve just made a terrible mistake: rather than creating a billion happy conscious subjects, they’ve just made one exquisitely happy subject with a billion (hedonically redundant) instantiations! To rectify this situation, however, all they’d need to do would be to introduce an element of variation into their Sims – some small phenomenal or psychological difference that meant that each of the billion simulations was subjectively unique. If IPD is right, this simple change would increase the happiness in the universe a billion-fold. 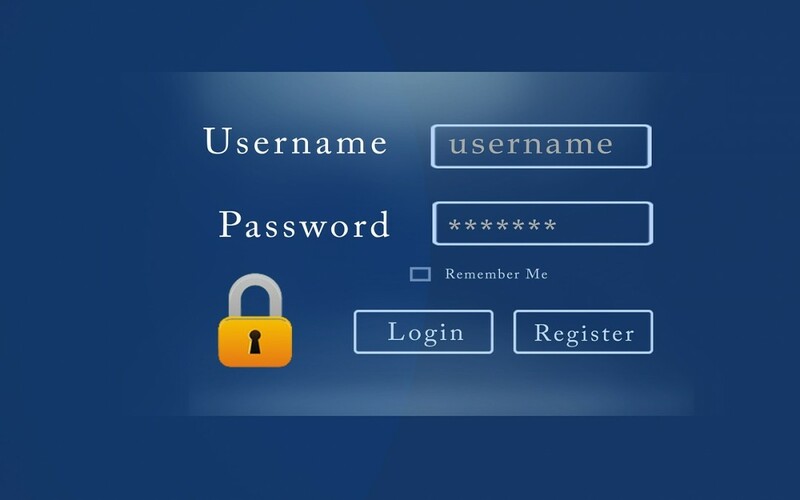 There are other potential interesting applications of IPD. For example, coupled with a multiverse theory, it might have the consequence that you currently inhabit multiple distinct worlds, namely all those in which there exist entities that realize subjectively and psychologically identical mental states. Similarly, it might mean that you straddle multiple non-continuous areas of space and time: if the same identical simulation is run at time t1 and time t2 a billion years apart, then IPD would suggest that a single subject cohabits both instantiations. Anyway, while I doubt I’ve convinced anyone (yet!) of this particular crazyism of mine, I hope at least it might provide the basis for some interesting metaphysical arguments and speculations. 'Dial 888,' Rick said as the set warmed. 'The desire to watch TV, no matter what's on it. 'I don't feel like dialling anything at all now,' Iran said. 'Then dial 3,' he said. We don’t have direct control over most our beliefs and attitudes, let alone most of our drives and desires. No matter how much money was offered as an incentive, for example, I couldn’t will myself to believe in fairies by this evening. Similarly, figuring out how to rid ourselves of our involuntary prejudices and biases is tricky (see here for an attempt), and changing our basic drives (such as our sexual orientation) is almost certainly impossible. That’s not to say that we have zero control over any of these things. If I wanted to increase the likelihood of having religious beliefs, for example, I might decide to start hanging out with religious people, or attending services. But it’s a messy and indirect path to acquiring new beliefs and values. Imagine, then, how useful it would be if we had some kind of more direct ability to control our minds. 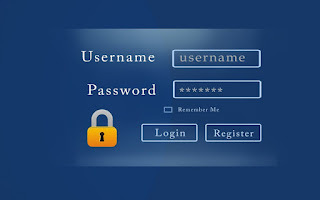 In thinking about this possibility, a useful analogy comes from the idea of Administrator access on a computer. What if – perhaps for just a few hours a month – you could delve into your beliefs, your values, and your drives, and reconfigure them to your heart’s content, before ‘logging back in’ as your (now modified) self? Some immediately tempting applications of this possibility are fairly clear. For one, we’d perhaps want to eliminate or tone down our most egregious cognitive biases: confirmation bias, post-purchase rationalization, the sunk cost fallacy, and so on. Similarly, we might want to rid ourselves of implicit prejudices that we may have against groups or individuals. Prejudiced against elderly people? Just go into Settings Menu and adjust your slider to correct it. Irrationally resentful of a colleague who accidentally slighted you? A quick fix to remove the relevant emotion and you’re sorted. Another attractive application might be to bring our immediate desires into line with our higher-order desires. Crave cigarettes and wish you didn’t? Tamp down the relevant first-order desire and you’re sorted. Wish you had the motivation to run in the mornings? Then ramp up the slider for “desire to go jogging”. We might even want to give ourselves some helpful false beliefs or ‘constructive myths’. Disheartened by the fact that you as an individual can do little to prevent climate change? Maybe a false belief that you can be a powerful agent for change will help you do good. Finally, we come to the most controversial stuff, like values, drives, and memories. Take values first. Imagine that you find yourself trapped in a small town where you’re ostracised for your deviant political beliefs. One easy option might be to simply tweak your values to come into line with your community. Or imagine if you could adjust things like your sexual drives and orientation. Certainly, some people might feel relief at ridding themselves of certain kinks or fetishes that they found oppressive, while others might enjoy experimenting with recalibrating their sexuality. But we could also find that people were pressured or tempted to adjust their sexuality to bring it into line with the bigoted social expectations of their community, and it’s hard not to find that a morally troubling idea. Finally, imagine if we could wipe away unpleasant memories at will – the bad relationships, social gaffes, and painful insults could be gone in a moment. What could possibly go wrong with that? As much as I like the idea of tweaking my mind, I feel uncomfortable about lot of these possibilities. First, at the risk of sounding cliched, it seems like the gains of personal growth are often as much in the journey as the destination. So, take someone who learns to become more patient with others’ failings. Along the way, she’s probably going to pick up a bunch of other important realizations – of her own fallibility, perhaps, or of the distress she’s caused in the past by dismissing people. Skipping straight to the outcome threatens to cheat her, and us, of something valuable. Similarly, sometimes along the road of personal change, we realize that we’ve been aiming for the wrong thing. Someone who desperately wants to fit in with their peer group, for example, might slowly and painfully realize that they don’t like their peers as much as they thought. Skipping out the journey, then, not only robs us of potential goods we might find along the way, but also of the capacity to change our mind about where we’re going. There might also be some kinds of extrinsic goods that would be lost if we could all tweak our minds so effortlessly. Take the example of someone who wishes he could fit in with his more conservative community. Even though he might relish not having values that are different from those around him, by holding onto them, he could be providing encouragement and cover for other political deviants in his town. In much the same way, diversity of opinion, outlook, and motivation may be valuable for the community at large, despite not always being pleasant for those in the minority. This can be true even if the majority perspective in the community is in the right: dissenters can helpfully force the dominant voices to articulate and justify their views. Finally, we could run into serious unexpected consequences – maybe getting rid of the availability heuristic would turn out to drastically slow down my reasoning, for example, or perhaps making myself more prosocial could backfire on me if I live in an antisocial community. Still more catastrophic consequences might involve deviant paths to fulfilment of desires. If (in Administrator mode) I give myself an overriding desire to be “fitter than the average person in my town”, for example, I might (as a normal user) go on to decide that the fastest way to achieve that goal is to kill all the healthy people in my community! More prosaically, it’s also easy to imagine people being tempted to reconfigure their difficult-to-achieve desires (like becoming rich and famous) and instead replacing them with stuff that’s easy to achieve (collecting paperclips, say, or counting blades of grass). Perhaps they would be well advised to do so, but this is philosophically controversial to say the least! While Administrator Access to our own minds is of course just science fiction for now, I think it’s a useful tool for probing our intuitions about well-being, rationality, and personal change. It could also potentially guide us in situations where do have more powerful ways of influencing the development of minds. This may be a big deal in the development of future forms of artificial intelligence, for example, but something similar arguably applies even when we’re deciding how to raise our children (should we encourage them to believe in Santa Claus?). For my part, I doubt I could resist making a few tweaks to myself (maybe I’d finally get to make good use of that gym membership). But I’d do so carefully... and likely with a sense of trepidation and unease. 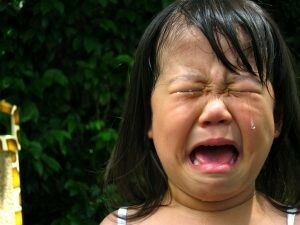 As any parent can readily testify, little kids get upset. A lot. Sometimes it’s for broadly comprehensible stuff - because they have to go to bed or to daycare, for example. Sometimes it’s for more bizarre and idiosyncratic reasons – because their banana has broken, perhaps, or because the Velcro on their shoes makes a funny noise. For most parents, these episodes are regrettable, exasperating, and occasionally, a little funny. We rarely if ever consider them tragic or of serious moral consequence. We certainly feel some empathy for our children’s intense anger, sadness, or frustration, but we generally don’t make a huge deal about these episodes. That’s not because we don’t care about toddlers, of course – if they were sick or in pain we’d be really concerned. But we usually treat these intense emotional outbursts as just a part of growing up. Nonetheless, I think if we saw an adult undergoing extremes of negative emotion of the kind that toddlers go through on a daily or weekly basis, we’d be pretty affected by it, and regard it as something to be taken seriously. Imagine you’d visited a friend for dinner, and upon announcing you were leaving, he broke down in floods of tears, beating on the ground and begging you not to go. Most of us wouldn’t think twice about sticking around until he felt better. Yet when a toddler pulls the same move (say, when we’re dropping them off with a grandparent), most parents remained, if not unmoved, then at least resolute. What’s the difference between our reactions in these cases? In large part, I think it’s because we assume that when adults get upset, they have good reasons for it – if an adult friend starts sobbing uncontrollably, then our first thought is going to be that they’re facing real problems. For a toddler, by contrast – well, they can get upset about almost anything. This makes a fair amount of sense as far as it goes. But it also seems to require that our moral reactions to apparent distress should be sensitive not just to the degree of unhappiness involved, but the reasons for it. In other words, we’re not discounting toddler tantrums because we think little kids aren’t genuinely upset, or are faking, but because the tantrums aren’t reflective of any concerns worth taking too seriously. Interestingly, this idea seems at least prima facie in tension with some major philosophical accounts of happiness and well-being, notably like hedonism or desire satisfaction theory. By the lights of these approaches, it’s hard to see why toddler emotions and desires shouldn’t be taken just as seriously as adult ones. These episodes do seem like bona fide intensely negative experiences, so for utilitarians, every toddler could turn out to be a kind of negative utility monster! Similarly, if we adopt a form of consequentialism that aims at maximizing the number of satisfied desires, toddlers might be an outsize presence – as indicated by their tantrums, they have a lot of seemingly big, powerful, intense desires all the time (for, e.g., a Kinder Egg, another episode of Ben and Holly, or that one toy their older sibling is playing with). One possibility I haven’t so far discussed is the idea that toddlers’ emotional behavior might be deceptive: perhaps the wailing toddler, contrary to appearances, is only mildly peeved that a sticker peeled off his toy. There may be something to this idea: certainly, toddlers have very poor inhibitory control, so we might naturally expect them to be more demonstrative about negative emotions than adults. That said, I find it hard to believe that toddlers really aren’t all that bothered by whatever it is that’s caused their latest tantrum. As much as I may be annoyed at having to leave a party early, for example, it’s almost inconceivable to me that it could ever trigger floods of tears and wailing, no matter how badly my inhibitory control had been impaired by the host’s martinis. (Nonetheless, I’d grant this is an area where psychology or neuroscience could be potentially informative, so that we might gain evidence that toddlers’ apparent distress behavior was misleading). But if we do grant that toddlers really get very upset all the time, is it a serious moral problem? Or just an argument against theories that take things like emotions and desires to be morally significant in their own right, without being justified by good reasons? As someone sympathetic to both hedonism about well-being and utilitarianism as a normative ethical theory, I’m not sure what to think. Certainly, it’s made me consider whether, as a parent, I should take my son’s tantrums more seriously. For example, if we’re at the park, and I know he’ll have a tantrum if we leave early, should I prioritize his emotions above, e.g., my desire to get home and grade student papers? Perhaps you’ll think that in reacting like this, I’m just being overly sentimental or sappy – come on, what could be more normal than toddler tantrums! – but it’s worth being conscious of the fact that previous societies normalized ways of treating children that we nowadays would regard as brutal. There’s also, of course, the developmental question: toddlers aren’t stupid, and if they realize that we’ll do anything to avoid them having tantrums, then they’ll exploit that to their own (dis)advantage. Learning that you can’t always get what you want is certainly part of growing up. But thinking about this issue has certainly made me take another look at how I think about and respond to my son’s outbursts, even if I can’t fix his broken bananas. Note: this blogpost is an extended exploration of ideas I earlier discussed here. 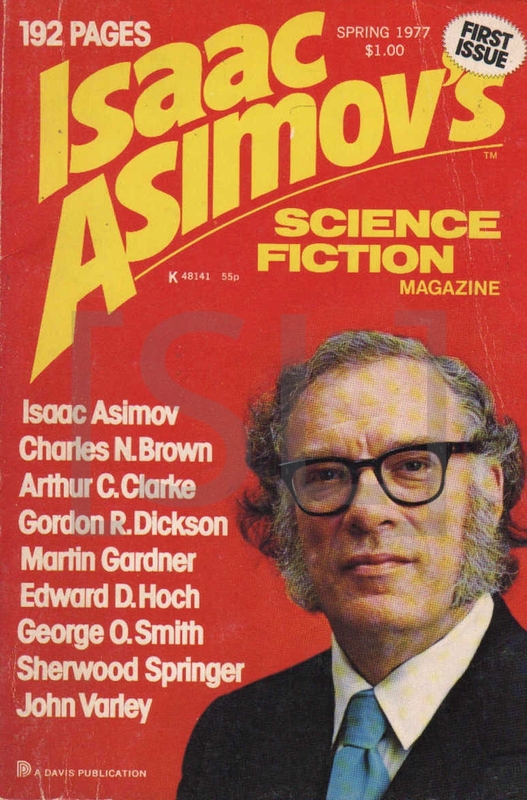 In 2014, as a beginning writer of science fiction or speculative fiction, with no idea what magazines were well regarded in the industry, I decided to compile a ranked list of magazines based on awards and "best of" placements in the previous ten years. Since people seemed to find it useful or interesting, I've been updating it annually. Below is my list for 2017. (2.) I gave each magazine one point for each story nominated for a Hugo, Nebula, Eugie, or World Fantasy Award in the past ten years; one point for each story appearance in any of the Dozois, Horton, Strahan, Clarke, or Adams "Year's Best" anthologies; and half a point for each story appearing in the short story or novelette category of the annual Locus Recommended list. (5.) I'm not attempting to correct for frequency of publication or length of table of contents. (6.) I'm also not correcting for a magazine's only having published during part of the ten-year period. Reputations of defunct magazines slowly fade, and sometimes they are restarted. Reputations of new magazines take time to build. (7.) Lists of this sort do tend to reinforce the prestige hierarchy. I have mixed feelings about that. But since the prestige hierarchy is socially real, I think it's in people's best interest -- especially the best interest of outsiders and newcomers -- if it is common knowledge. (8.) I take the list down to 1.5 points. (10.) ETA: Check out Nelson Kingfisher's analysis of acceptance rates and response times for these magazines below. (1.) The New Yorker, Tin House, McSweeney's, Conjunctions, Harper's, and Beloit Fiction Journal are prominent literary magazines that occasionally publish science fiction or fantasy. Cosmos, Slate, and Buzzfeed are popular magazines that have published a little bit of science fiction on the side. e-flux is a wide-ranging arts journal. The remaining magazines focus on the F/SF genre. (3.) One important thing left out of these numbers is the rise of good podcast venues such as the Escape Artists' podcasts (Escape Pod, Podcastle, Pseudopod, and Cast of Wonders), Drabblecast, and StarShipSofa. None of these qualify for my list by existing criteria, but podcasts are an increasingly important venue. Some text-based magazines, like Clarkesworld, Lightspeed, and Strange Horizons also regularly podcast their stories. (5.) Philosophers interested in science fiction might also want to look at Sci Phi Journal, which publishes both science fiction with philosophical discussion notes and philosophical essays about science fiction. (6.) Other lists: The SFWA qualifying markets list is a list of "pro" science fiction and fantasy venues based on pay rates and track records of strong circulation. Ralan.com is a regularly updated list of markets, divided into categories based on pay rate. (7.) The "Sad Puppy" kerfuffle threatens to damage the once-sterling reputation of the Hugos, but the Hugos are a small part of my calculation and the results are pretty much the same either way. One of my favorite living philosophers, Nomy Arpaly, has a new blog, The View from the Owl's Roost! It's off to a great start, with a fun, insightful post about our excessive confidence in our limited imaginations. 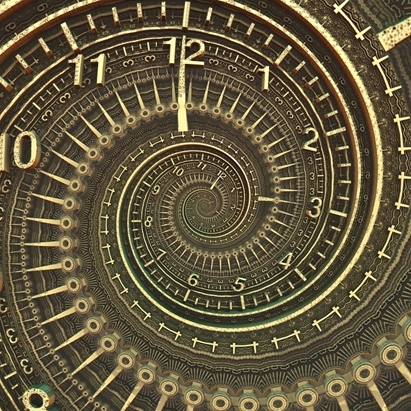 Time travel is a more or less ubiquitous feature of modern sci-fi. Almost every long running SF show – Star Trek, Futurama, The X-Files – will have a time travel episode sooner or later, and some, like Doctor Who, use time travel as the main narrative device. The same applies to novels and, of course, to Hollywood – blockbuster SF franchises like the Terminator and Back to the Future employ it, as do quirkier pictures like Midnight in Paris. And of course, there’s no shortage of time travel novels, including old favorites like A Christmas Carol, and perhaps most influentially, HG Wells’s wonderful social sci-fi novella The Time Machine. I don’t find it particularly surprising that we’re so interested in time travel. We all engage in so called ‘mental time travel’ (or Chronaesthesia) all the time, reviewing past experiences and imagining possible futures, and the psychological capacities required in our doing so are the subject of intense scientific and philosophical interest. 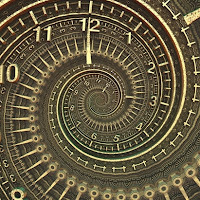 Admittedly, the label “mental time travel” may be a bit misleading here; most of what gets labelled mental time travel is quite different from the SF variant, consisting in episodic recall of the past or projection into the future rather than imagining our present selves thrown back in time. But I think we also do this latter thing quite a lot. To give a commonplace example, we’re all prone to engage in “coulda woulda shoulda” thinking: if only I hadn’t parked the car under that tree branch in a storm, if I only I hadn’t forgotten my wedding anniversary, if only I hadn’t fumbled that one interview question. Frequently when we do this, we even elaborate how the present might have been different if we’d just done something a bit differently in the past. This looks a lot like the plots of some famous science fiction stories! Similarly, I’m sure we’ve all pondered what it would be like to experience different historical periods like the American Revolution, the Roman Empire, or the age of dinosaurs (you can even buy a handy t-shirt). More prosaically, I imagine many of us have also reflected on how satisfying it would be to relive some of our earlier life experiences and do things differently the second time round – standing up to high school bullies, or studying harder in high school (again, a staple of light entertainment). Given the above, I had always assumed that time travel was part of fiction because it was simply part of us. Time travel narratives, in other words, were borrowed from the kind of imaginings we all do all the time. It was with huge surprise, then, that I discovered (while teaching a course on philosophy and science fiction) that time travel doesn’t appear in fiction until the 18th century, in the short novel “Memoirs of the Twentieth Century”. Specifically, this story imagines letters from the future being brought back to 1728. The first story of any kind (as far as I’ve been able to find) that features humans being physically transported back into the past doesn’t come until 1881, in Edward Page Mitchell’s short story “The Clock That Went Backwards”. Maybe this doesn’t seem so surprising – isn’t science fiction in the business of coming up with bizarre, never before seen plot devices? But in fact, it’s pretty rare for genuinely new ideas to show up in science fiction. Long before we had stories about artificial intelligence, we had the tales of Pinocchio and the Golem of Prague. Creatures on other planets? Lucian's True History had beings living on the moon and sun back in the 2nd century AD. For huge spaceships, witness the mind-controlled Vimanas of the Sanskrit epics. And so on. And yet, for all the inventiveness of folklore and mythology, there’s very little in the way of time travel to be found. The best I’ve come up with so far is some time dilation in the stories of Kakudmi in the Ramayanas, and visions of the past in the Book of Enoch. But as far as I can tell, there’s nothing that fits the conventional time travel narratives we’re used to, namely physically travelling to ages past or future, let alone any idea that we might alter history. What’s going on here? One possibility is that something changed in science or society in the 18th century that paved the way for stories about time travel. But what would that be, and how would it lead to time travel seeming more plausible? For example, if the first time travel literature had accompanied the emergence of general relativity (with all its assorted time related weirdness), then that would offer a satisfying answer. However, Newtonian physics was already in place by the late 17th century, and it’s not clear which of Newton’s principles might pave the way for time travel narratives. I’m very open to suggestions, but let me throw out one final idea: time travel narratives don’t show up in earlier fiction because they’re weird, unnatural, and counterintuitive. Even weirder than the staples of folklore and mythology, like people being turned into animals. Time travel is just not the kind of thing that naturally occurs to humans to think about at all, and it’s only via a few fateful books in the 18th century and its subsequent canonisation in The Time Machine that it’s become established as a central plot device in science fiction. But doesn’t that contradict what I said earlier about how we all often naturally think about time travel related scenarios, like changing the past, or witnessing historical events firsthand? Not necessarily. Maybe these kinds of thought patterns are actually inspired by time-travel science fiction. In other words, prior to the emergence of time travel as a trope, maybe people really didn’t daydream about meeting Julius Caesar or going back and changing history. Perhaps the past was seen simply as a closed book, rather than (in the memorable words of L. P. Hartley) just “a foreign country”. That’s not to suggest, of course, that people didn’t experience memories and regrets, but maybe they experienced them a little differently, with the past seeming simply an immutable background to the present.